The midfielder netted in just 12.2 seconds, beating the record held by Anthony Stokes. 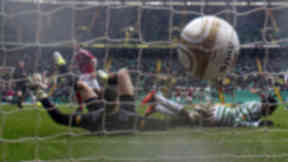 Kris Commons has set a new record for the fastest ever Scottish Premier League goal. The Celtic midfielder found the net in just 12.2 seconds in his side's 4-3 win over Aberdeen at the weekend, beating the previous time set by Anthony Stokes. Stokes had scored in 12.4 seconds in a game for Hibernian against Rangers in 2009. Coincidentally, the Irish striker provided the assist for Commons to net. "I don’t think half the fans were even in the stands yet. The manager wasn’t even in the dugout so it was a bit of whirlwind. "It beat Stoksey's record. He was telling me afterwards that he was sure I´d beat him so I think he's a little bit wounded now."